If the safety of our food or water is ever in question, it’s going to get the attention of the masses. And so is the case with bisphenol A, or BPA, a chemical involved in the creation of plastic and epoxy resins. Just this week, the Environmental Protection Agency made an announcement about it. Much of the attention BPA has received is associated with the potential health risk from the use of plastic in materials such as water bottles, baby bottles, and reusable food storage containers. News stories cite research indicating that the chemical can leach from the plastic into the food or beverage, thus causing a health concern from the exposure. Infants and children may be particularly susceptible because their brain and other systems are not fully developed. Canned products are now also being reviewed, as BPA is used as part of the epoxy resin in the can’s lining. The resin coating helps prevent bacteria from spoiling the food product. 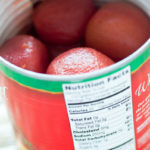 The same health concern from BPA exposure may be present for those consuming canned products (including infant formula). As with other health and safety issues, more information is needed, and many questions remain. What are the longer term effects of BPA exposure? How can manufacturers avoid using BPA in certain products? How are concerns about BPA impacting product and brand choices among consumers? – Don’t microwave polycarbonate plastic food containers. Polycarbonate is strong and durable, but over time it may break down from over use at high temperatures. Polycarbonate containers that contain BPA usually have a #7 on the bottom. – Reduce your use of canned foods. – When possible, opt for glass, porcelain or stainless steel containers, particularly for hot food or liquids. – Use baby bottles that are BPA free. As we said, balance is key, so we won’t shy away from all canned goods. We wish there was enough time in the day to home can our own tomatoes, but sometimes, they just have to come from the market. So here’s a recipe for a most delicious and simple marinara adapted from Cook’s Illustrated. Melt 1-2 Tbsp. unsalted butter in a saucepan on medium heat. Add 1/3 cup diced onion, ¼ tsp. dried Italian spices, ½ tsp. salt. Cook and stir until the liquid is nearly evaporated and the onion begins to brown. Add 2 or 3 cloves of minced or crushed garlic and cook about 30 seconds. Stir in a 28-oz. 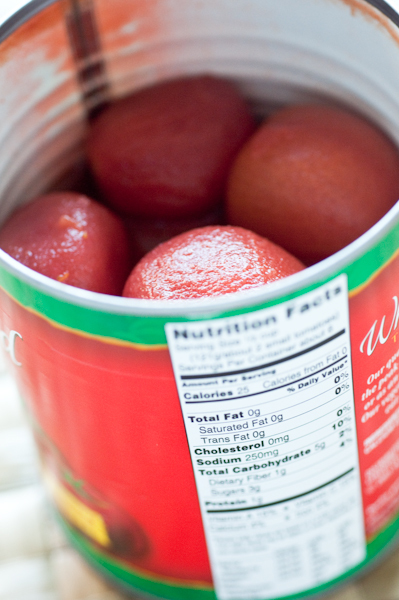 can of crushed tomatoes (we just crushed a can of whole tomatoes) and ½ tsp. sugar. Bring to a simmer. Lower heat and simmer about 25 minutes until reduced to about 2 ½ cups. Add about a tablespoon of olive oil off of the heat and season with salt and pepper to taste. Cook’s Illustrated recommends adding 2 tablespoons of chopped basil leaves, but we left that out. Remember, season dishes to your own taste, sampling it along the way! 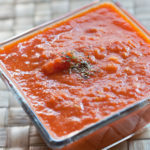 The marinara can be enjoyed chunky or made smooth with an immersion blender. How Stacey Got the Shot: ISO 800, 60mm focal length, f/4, 1/60 second exposure. "US Department of Health and Human Services"
As a mom, this topic has been alarming many parents, to say the least. But as with many items in the news, it’s sometimes hard to separate fact from fiction. Thanks for the run-down on what’s going on! I’m going to forward this to some of the concerned parents I know.